MLM's Minor Home Repair team meets weekly to put their know-how to work for the benefit of seniors and low-income neighbors, to help make their homes safe and livable. 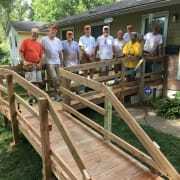 Ramp-building is their specialty, as well as home repairs of many varieties. Work days are scheduled on Tuesdays AND on the fourth Saturday of each month.